But the 80-minute ceremony attended by 528 undergraduates in five colleges — Theology, Fine Arts and Production, Education, Humanities and Social Sciences and Science, Engineering and Technology — also was punctuated by poignant circumstances. For one, several graduates in the first CSET class adorned their mortarboards in ways unique to their career paths, such as outlines of bodies and crime scene tape. But the festivities also had a somber, distinguishing moment with the posthumous award of a degree in music to Ashley Kathleen Laneri, who died at age 22 on March 13, 2015, from injuries she sustained in a car accident. 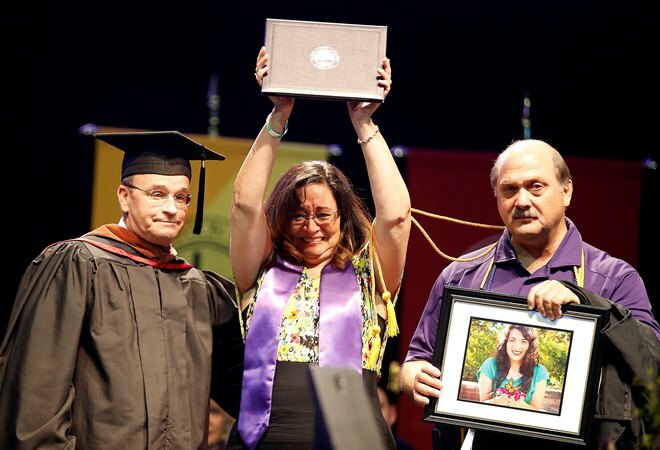 The announced Arena audience of 3,806 came to its feet as Ashley’s parents, Kathy and Eric, accepted their daughter’s diploma from COFAP Dean Claude Pensis, then turned to the graduates and raised Ashley’s diploma and a framed photo of her to the heavens. Family members, including Ashley’s three siblings, as well as people who never met her, wiped away their tears. A buoyant GCU-style video delivered an inspirational look at the ways GCU helps its students find their purpose — in Christ, classrooms, collaborations, campus, Colangelo, courts, construction, classical guitar and, again, in Christ. 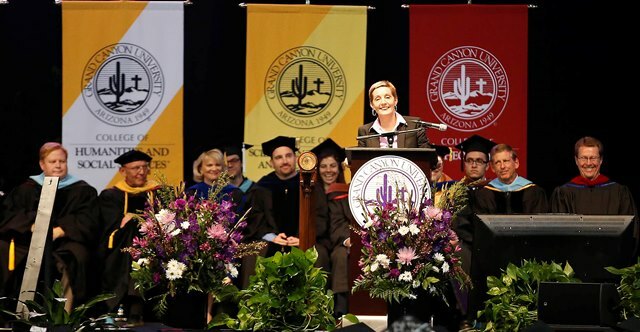 During the afternoon ceremony for graduates in the Colangelo College of Business and the College of Nursing and Health Care Professions, Mueller told an announced crowd of 4,001 that GCU students are known in the community for more than just their academics and athletic talents. At both ceremonies, Mueller introduced the commencement speaker, comedian Karen Mills, a 5-foot-2 former college basketball star and ovarian cancer survivor who tailored her remarks to the mostly youthful Class of 2015. She began with a congratulatory text on the giant Arena screen, which ended with MTFBWY — “May The Force Be With You” — and ended by using a selfie stick to take photos of her and them. Do what you can — it all adds up. Do the work — you never know when it will be your moment to shine. Surround yourself with good people and let them do their jobs. Before leaving the podium, Mills gazed at the screen again, where a video had extraordinary scenes in nature, galloping horses, towering redwoods and a soaring eagle, as well as global achievements such as man walking on the moon. It’s been three years since Xenia Gutierrez graduated from Trevor G. Browne High School in west Phoenix, and it didn’t take long for her to return. Xenia Gutierrez grew up in west Phoenix and will return home to teach math at Trevor G. Browne High School. 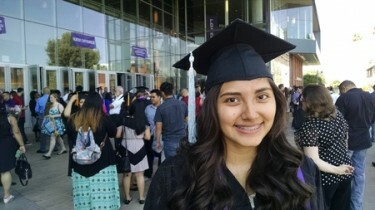 The 21-year-old graduated early from GCU with a bachelor’s degree in secondary education with an emphasis in math because she took college credits while still in high school. And even before her degree was conferred, she earned a staff position at her hometown high school less than eight miles from the University. There was no need to job-hunt elsewhere, she said. Gutierrez is the first in her family to attend and graduate from college. Her parents never finished secondary school in their native Mexico, so their daughter’s accomplishment will be well celebrated. After an incredibly busy year, Gutierrez said she’ll likely relax this summer and prepare for the five classrooms of ninth-grade algebra students she’ll begin teaching in August. Not only did Gutierrez land a teaching job right out of college, she also earned a job in the middle of her student-teaching placement at North Pointe Preparatory, a Phoenix charter school. She’s been teaching full-time this semester, handling five algebra classes and a geometry class there to help fill a void. Such opportunities are rare but fitting in cases where the student-teacher is capable of handling a full-time course load while being observed by the host school. Now, those GCU-driven opportunities and others — such as her math practicum work at nearby Alhambra High — have given her the confidence and experience to walk confidently to the front of the classroom at Trevor Browne and get teens interested in math. “I think if I can connect with them, I can get them to work hard and care about their education and future,” Gutierrez said. After all, she’s a real-world example of how the mold can be broken. Joshua Gee couldn’t have been blamed if he wanted to break into a celebratory dance Thursday after receiving his diploma for a bachelor’s in business management. He deserves it. 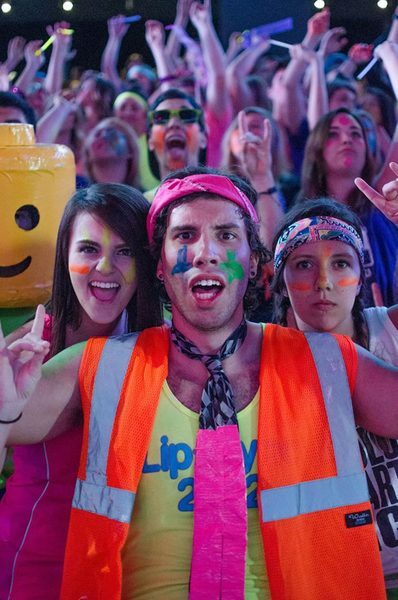 Gee, 23, led the GCU Havocs student section at campus athletic events as a senior and is no stranger to busting a move. And after four years of school, more than 20 relocations in 19 years and a baptism last Sunday, a celebration is in order. “I’ve been through so much I feel like I have to dance or do something on stage,” said Gee, who was born at a U.S. Air Force base in Bitburg, Germany. After Germany, Gee moved between the U.S. and Beijing, China, three times. He lived in three states and attended five high schools in Colorado. His family moved back to Beijing, where Gee spent a year at a university before coming to GCU. The consistent moving wasn’t the only chaotic part of his life. He characterizes his past as “troubled” with a string of poor decisions, and he chose GCU for selfish reasons. He “hit rock bottom” his junior year and decided to become a Christian. Since his transformation, Gee has been one of the University’s most passionate and outspoken students. Whether he was leading cheers for the Havocs or organizing events on campus, he made sure to spread the University’s message of servant leadership. He hopes to become a GCU resident director after graduation. Gee was among students asked to speak at the senior basketball dinner earlier this month. As he began his speech, a “Gee” chant echoed throughout GCU Arena. He said it was one of the most humbling moments of his life. He has a special affection for GCU for rescuing him from a past of questionable choices. Now, Gee wants to make an even bigger impact on the University as a graduate. 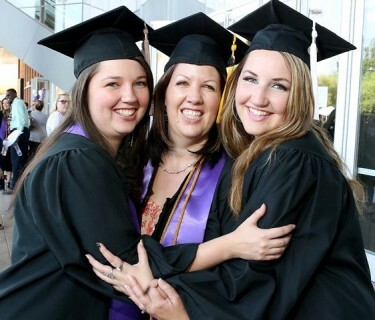 Before enrolling at GCU in 2013, Carol Weikle already was an educated woman with a good job. She had degrees from the University of Arizona in education and vocational rehabilitation counseling and evaluation and had developed a long and satisfying career helping people with physical, mental and emotional disabilities return to work. And then, “life happened,” in a number of jarring ways that persuaded Weikle to sign up for the rigorous BSN program in the College of Nursing and Health Care Professions. First, it happened to her husband, Keith. “I watched him nearly die more times than I could imagine,” the 54-year-old Glendale resident said of Keith’s nearly decade-long wait for a liver transplant after his Hepatitis C diagnosis in 2001. “I had nine years of researching ways to change the system, and I knew where I wanted to go. Two years after his transplant surgery in 2010, Keith was diagnosed with early stage colon cancer. He was treated and recovered, but then it was Weikle’s turn. In June 2013, two months before starting the nursing program at GCU, she was diagnosed with pancreatic cancer. During her treatment, which included surgery, chemotherapy and radiation, and recovery, she had to repeat only two classes. She credits her tenacity, the assistance of GCU’s faculty and disability office and her classmates. She most enjoyed clinical rotations in obstetrics, pediatrics, psychiatry and medical-surgical and wants to work in the field of transplantation, ultimately as a nurse transplant coordinator. She was proud to walk across the Arena dais Thursday to receive her diploma. “I think I’ve earned this one,” Weikle said. 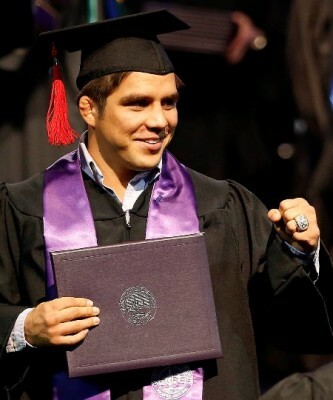 There were plenty of top-quality athletes graduating today, but it’s hard to imagine anyone tougher than Henry Cejudo. Not only is Cejudo, 28, undefeated through eight bouts as an Ultimate Fighting Championships featherweight (125 pounds), he also earned a degree in Christian studies. Despite his busy schedule, he still hopes to get a master’s degree and dreams of one day starting a nonprofit or becoming a school principal. The way Cejudo’s fighting career is progressing, however, he’ll be leading the way and giving lessons in the sport for a while. He established himself as a world-class wrestler by winning four consecutive state high school championships — two at Maryvale High and two in Colorado, where he was in the resident freestyle program at the U.S. Olympic Training Center — and then taking the gold medal at 55 kilograms in the 2008 Olympic Games. “MMA is an art,” he said. “It’s a science. It takes a certain discipline to do it. I know it’s a violent sport, but I see it as an example to teach lessons in life. And Cejudo leaves no doubt where he stands on mixed martial arts. He’s nicknamed “The Messenger” and is ranked 10th at 125 pounds. “It takes a certain kind of person to fight — there are no average Joes in there,” he said. Least of all this guy. It was a surgery that would get many bystanders turning to run out the door. 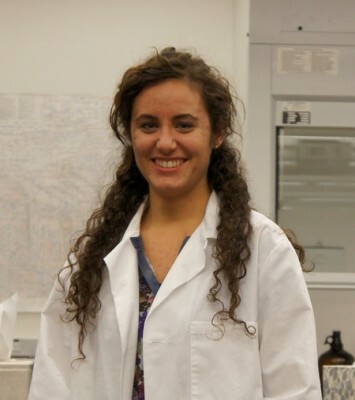 But graduating pre-med senior Rita Bybee found it fascinating and couldn’t avert her eyes. During one operating room observation at her recent internship at Maricopa Medical Center in Phoenix through the prestigious Surgery Undergraduate Research Fluency program, Bybee, 21, was amazed to witness doctors removing most of the skin from a man’s lower face and neck. The senior patient was suffering from cancer in his lower lip. Bybee said the latest report was that his health had improved after the surgery, which further inspired her to go to medical school and become a surgeon. As president of GCU’s chapter of the AzHOSA health care professions organization, Bybee helped hundreds of GCU students develop their career visions. But she also humbly credited GCU and pre-health advisers Helen Howard and Cherissa Medina for linking her into the career-development opportunities that health care students need to set themselves apart from the competition for medical school placements. “If it wasn’t for them, I wouldn’t have applied for that and got (the SURF internship),” said Bybee, who grew up in Lake Havasu City, Ariz., and has hosted tours at the campus cadaver lab for current students from her old high school. When she was in high school, it was one of those tours that hooked her on GCU. She added that as she investigates medical schools and goes through that rigorous application process this summer, she’ll also take a moment to smell the roses after a busy undergraduate run that included volunteering and serving as a campus Life Leader through the Office of Spiritual Life. 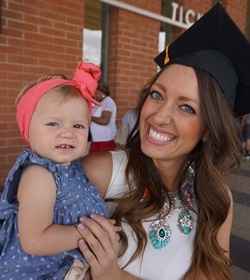 The “excellence that instructors expect” from GCU students, she said, prepared her for that process, too, and helped her understand the type of care she plans to provide for her own patients in the future. Cammie Thornton and baby Phoebe before commencement Thursday. Nursing school is hard, what with all that science and testing and selfless care for complete strangers. But imagine being pregnant and having a baby while getting your BSN. That’s what at least two of the 461 traditional students who graduated with their nursing degrees Thursday did. Olivia Saverino gave birth to Jude on July 28, 2014, just as she was getting ready to start her Level 3 courses. The pregnancy was easy. Balancing studying and Jude’s sleep “schedule,” not so much. “He was so worth it, but my advice to others is to wait until you’re out of school,” Saverino said. Cammie Thornton delivered baby Phoebe on April 17, 2014, right in the middle of finals. Four days later, Mama returned to campus to take her last test, then took the summer off school. 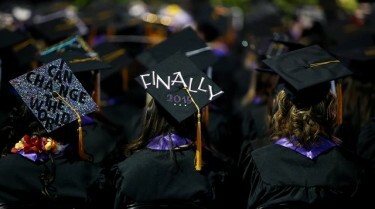 Mortarboards decorated by nursing students were nothing short of majestic. 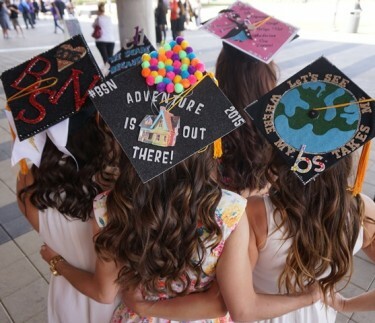 Saverino, Thornton and three friends got together before commencement for a mortarboard-decorating party. Organized by new graduate Jenny Chapko, a GCU Today preferred customer, the party also included Haley Irby and Elizabeth Chavez. Some of the girls used films, among them “Monster Inc.” and “Up,” as a theme for their hats. For her part, Chapko decided on a nursing career after volunteering at a hospital while she was a student at Corona del Sol High in Tempe. Jerome Garrison might have had a chip on his shoulder at times, but after four years of beating the odds, his shoulders should feel a little lighter. After graduating from Mountain Pointe High in Phoenix, where he had earned all-state offensive and defensive honors his senior year, Garrison didn’t garner much college interest. 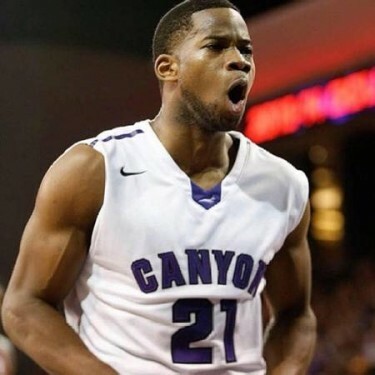 He had accepted a scholarship offer from GCU, an NCAA Division II program at the time, in his junior year and settled in as a role player in his first two seasons at the University. But when the Lopes moved up to Division I, the 6-foot-3 guard elevated his game, too, averaging 16.5 points per game and earning All-WAC Second Team and Defense Team honors as GCU took third place in the Western Athletic Conference. Garrison’s production fell off his senior year as a result of a season-stifling foot injury. He averaged just 7.8 points per game and was counted out by most to have a shot at continuing his basketball career. But as history has shown, Garrison, 22, keeps proving everyone wrong. He plans to play professionally in western Europe next fall and still hopes to eventually get a tryout for the NBA. Garrison said his faith in God has empowered him to persevere. When his hoops career does end — and he doesn’t see that happening anytime soon — he plans to open a basketball academy for underprivileged children called “Rome’s Home” to provide them the opportunities he didn’t have. When Suji Shin left Seoul, where she was born and raised, and moved to Wisconsin as a foreign exchange student, you might say she became an imported Cheesehead. You also might say the idea drew some lactose-intolerant reactions on the home front. 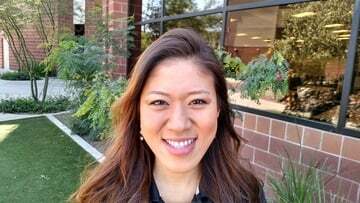 South Korea native Suji Shin served as president of the Associated Students of GCU. 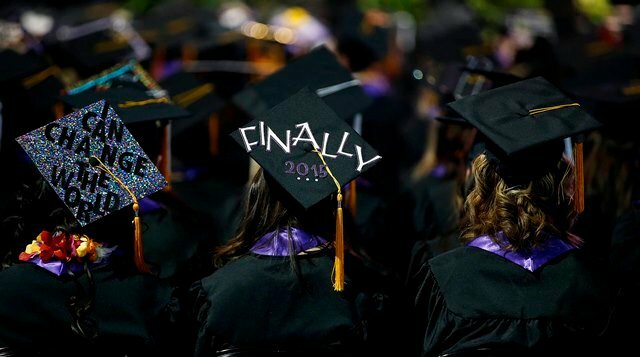 Seven years later, after persevering through the tough transition to Manitowoc, Wis., learning English, excelling at two different high schools and then moving on to GCU, where as a junior she was elected president of the Associated Students of GCU student government, she has graduated with a bachelor’s degree in business administration. And she is incredulous about the whole thing. The two most important ones are Nick and Kris Doneff, who took her into their home in Manitowoc, about an hour southeast of Green Bay, and later moved to Evergreen, Colo., to be closer to her while she was in college. “I know I wouldn’t be here now if it wasn’t for them,” she said. Being the ASGCU president wasn’t easy, either, but Shin persevered through that, too. While Shin is uncertain about where she’s supposed to do next, she’s pretty clear about her dream: She’d love to work in the United Nations, maybe even as an ambassador. “Being a policymaker, there’s a big need for that in the world,” she said. It’s been six years since her family emigrated from Europe, and Anamaria Lup felt instantly at home in Arizona and on campus at GCU. The 21-year-old is one of more than 20 students graduating from GCU’s forensic science program this week in the largest class since the program was established more than four years ago. She has seen it develop rapidly, and many of her peers are either going after jobs as forensic scientists or heading to graduate schools to pursue the degrees needed to become pathologists. With her degree, Lup hopes to progress to a graduate or doctorate program to eventually work in a medical examiner’s office solving death investigations. She’s getting married in June, so those applications to graduate programs will have to wait a bit. And if planning a wedding and graduating from college isn’t enough, Lup is part of the final class of GCU Servant Scholars, a faith-based program that has provided scholarship assistance to students who demonstrate Christian leadership in the community. 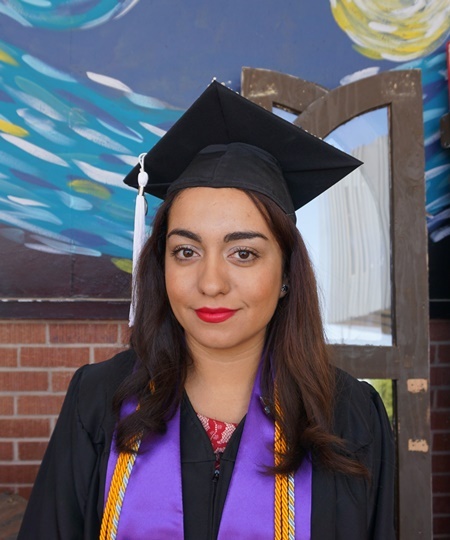 Additionally, while volunteering at Phoenix nonprofits such as the Changing Lives Center and Mentor Kids USA, she was a tour guide at GCU’s cadaver lab, worked as a science tutor in the Learning Lounge and recently completed the prestigious Surgery Undergraduate Research Fluency internship program at Maricopa Medical Center. 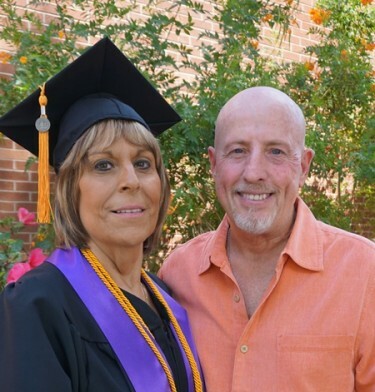 Gerald Sandoz had looked forward to watching his daughters Gina and Jordan graduate from Grand Canyon University with his wife, Robyn, at his side. But Robyn wasn’t next to him Friday morning — because she was getting her diploma, too. “A lot of tears were shed,” Gerald said. 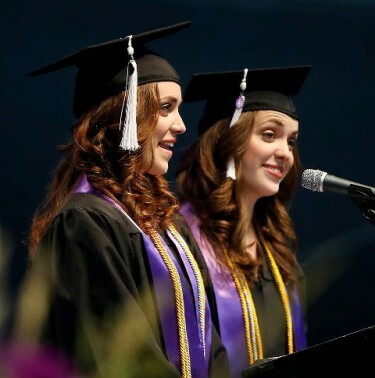 Thanks to the ingenuity and flexibility of the GCU events staff, Robyn was able to push back her graduation from December to April so she could be in cap and gown alongside her daughters, and Jordan, who was supposed to walk with other Colangelo College of Business graduates Friday afternoon, was allowed to join them. So there were Robyn and Jordan in the back row while Gina, a digital film major, walked with her fellow College of Fine Arts and Production grads. “I wanted to yell and scream,” Robyn said. Robyn said they didn’t realize until last fall that all three of them might be able to attend the same commencement ceremony. It certainly wasn’t something they planned. “It just kind of worked out that way,” Robyn said. Robyn is a double major in sociology and psychology and said she might use it to go into counseling. She and Gerald are youth leaders. “I really like teenagers and would like to find ways to help them,” she said. Jordan majored in business management and hopes to work for Disney. She said she is waiting to hear on an internship with the company. At Alhambra High and Grand Canyon University, Berta Ordonez-Cortes had mentors who are the kind of theatre teacher she wants to be — oozing creativity, teaching useful skills and providing a multitude of opportunities. “In theatre education, you need to know everything because they have you teach everything,” said Ordonez-Cortes, 22, who graduated Thursday with that degree from the College of Fine Arts and Production. She came to GCU in 2010 armed with a full scholarship and the desire to help rebuild the theatre side of the University’s arts program, which had closed four years before. The college did an admirable job, and most performances of recent main stage productions in Ethington Theatre have been sold out. “I loved how we were able to collaborate with our professors to build what it was before and to see the progress through the individual shows,” Ordonez-Cortes said. Bill Symington, assistant dean of theatre and dance, said she used her entrepreneurial spirit to carve out a niche in COFAP. Among her creations, Symington said, was an audition process, rehearsal schedule and program system for the college’s ArtsJam! Series, and under her leadership, the number of annual performances quadrupled. Ordonez-Cortes also was an assistant stage manager, worked on props, built sets and lit the stage. Her creativity and hard work were never more evident than in December, when she directed GCU theatre students in performances of a fractured fairy tale at local elementary schools. It was Ordonez-Cortes’ idea to do the roadshow, and COFAP Dean Claude Pensis approved. Symington saw that joy on the faces of students and school administrators at the fractured fairy tale performance. Jeremy Bridges spent 7½ years traveling the country in a 32-foot motor home, sharing one bathroom with his parents and six siblings (all separated by eight years). Graduating with a bachelor’s degree in digital film Thursday was a piece of cake by comparison. Bridges, 29, was born in Chicago and has lived in all 48 continental states. His family purchased a motor home when he was 11 and began a cross-country odyssey. His parents worked various jobs — from sugar beet farming in North Dakota to selling handmade crafts in Rhode Island — to fund their travels, and they homeschooled their kids. The constant travelling and making new friends was tough as a teen, he said. But Bridges appreciates the memories he collected while on the road. Traveling also encouraged him to pursue film. Arizona was the last state Bridges visited and GCU was the last university he considered, preferring its emphasis on storytelling. 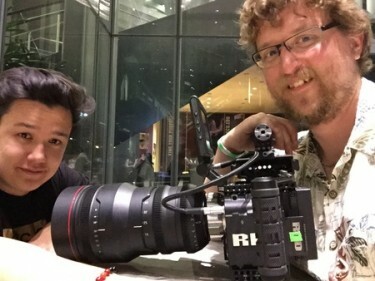 He hopes to become a Hollywood film director, and his fallback is to work as a news videographer. Bridges has some experience: He was a GCU Today student videographer this semester. His travel extends outside the U.S. — he has been on three mission trips to Southeast Asia and will leave for a fourth next week. He loves to travel and said he wouldn’t mind returning to a life on the road. James Holdren had never driven outside California when he transferred to GCU in August 2013, and the first things he saw made him wonder if he soon might be doing a U-turn. Western Arizona seemed so desolate. The neighborhood around the University was vastly different from what he had known at The Master’s College in Santa Clarita, Calif. And then the dust storms reminded him that he indeed was in the desert. But now embraces the local culture so much, he dreams of one day serving in the toughest areas of Detroit, Chicago or Los Angeles. “I just love the inner city now,” he said. What changed? Holdren’s perspective, that’s what. He quickly learned to appreciate the way GCU reaches out to the community. He learned from being around students with different backgrounds and ideas. But, mainly, he learned a lot about himself. Holdren had grown up in a Christian household but still didn’t feel committed to God. However, when a friend died in a beach accident his freshman year at The Master’s, it got Holdren thinking about his own mortality. Still, he said it was a “slow process” before a residential adviser shared a Bible story with him in a way he hadn’t heard before, and he became a Christian in March 2013. But the last two years have been anything but easy. Two of his grandparents died, Holdren lost another friend, this time to pneumonia, and he broke a rib in a Jet Ski accident last summer. The injury led to breathing issues that doctors feared might be a sign of lung cancer before he was cleared of that concern. Through it all, his faith became even stronger. “I wouldn’t trade that suffering for anything,” he said. And now that he has his degree in Christian studies with an emphasis in Biblical studies, he plans to enter Phoenix Seminary. There’s no thought about doing a U-turn any longer. While other GCU graduates shortly may be enjoying summer vacations, College of Education grad Clint Leavitt can’t wait to get to work. Leavitt, 20, who graduated with degrees in English and Christian studies Thursday, leaves May 5 for a monthlong summer internship at the Wales Evangelical School of Theology (WEST) in Bridgend, Wales, in the United Kingdom. 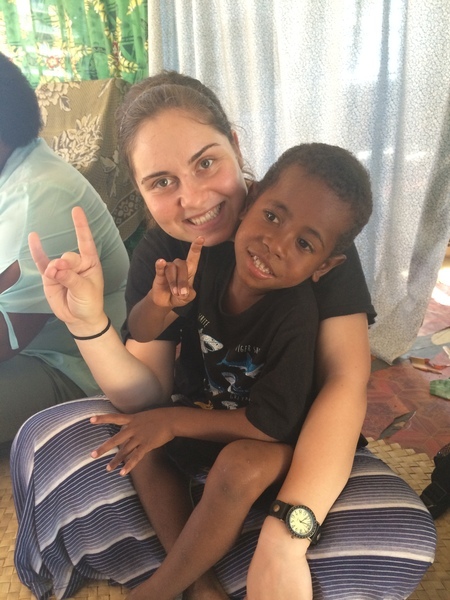 During a GCU mission trip last summer, he spent 10 days at WEST, mentoring children and organizing Christian community service events. Leavitt turned down job opportunities locally to accept the internship, in which he will write website content and facilitate events in WEST’s marketing and communication departments. GCU graduate Janie Moore and junior Kaity Johnson also are interning at WEST. Leavitt said it was the perfect opportunity to use his degrees and spirit to serve immediately after graduation. Last summer, Leavitt and GCU’s mission team in Wales organized a Western-themed night at WEST to encourage the local youth to attend church. Nearly 300 people attended the event, with many returning for church services each Sunday. Leavitt understands that people might view the U.K. as a place where missionary work is not as needed. But he has seen that need and wants to make a difference in that area. He hopes to land a full-time position or study a master’s degree in divinity at WEST after completing his internship.